Crispy Baked Pork Spring Rolls recipe with a Thai twist that are perfect to serve for dinner or a party appetizer! They are healthier because they’re baked right in the oven! I love making spring rolls at home, but I am frying inept. Each time I try to fry something I end up with oil splattered all over the kitchen. That problem is solved in this case because these babies are baked right in the oven! No frying necessary. You won’t miss the fried aspect of spring rolls in this case because these Crispy Baked Pork Spring Rolls are packed with flavor and still extra crispy on the outside. (post updated as of 9/12). 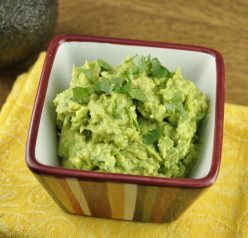 Today I present to you a great, non-greasy appetizer for game day or your Super Bowl party! I don’t watch football and have to admit that I always go all season without watching even one single game. Not even part of a game was watched by me. Don’t hate on me, all of you football fans (which is like everybody else in the world besides me)! I am a baseball girl and always will be. I do, however, watch the Super Bowl every year and look forward to all the absolutely ridiculous amounts of yummy junk food I will consume during those 3 hours. 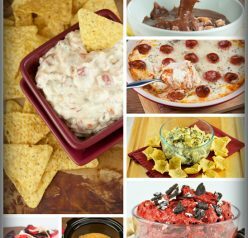 I would have to say that my favorite types of foods are appetizers: finger foods and chips dipped in hot dips, mostly. I could make entire meals out of them! These Crispy Baked Pork Spring Rolls turned out delicious. I especially liked this recipe because it was quick and easy, and you don’t have the huge hassle and cleanup of deep frying. It’s a great way to save some calories, too! I think they’re really just as good when they’re baked as they are when they are fried. They were super moist and flavorful even without the frying. You can make these ahead and bake them when you are ready for them! I included a recipe for a dipping sauce I tried from my friend Jessica’s page and, while a moderately spicy, I thought it went perfectly with the Crispy Baked Pork Spring Rolls. If you don’t like spice, stick with a sweet and sour or soy sauce. I paired these with some Thai chicken quesadillas which you will absolutely LOVE. They went very well together. You should also try my Philly Cheesesteak Baked Egg Rolls. 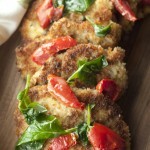 They are one of the most popular recipes on my site! Crispy Baked Pork Spring Rolls recipe with a Thai twist that are perfect to serve for dinner or a party appetizer! Sauté the garlic and ginger in the sesame and olive oils in large sauté pan set over medium-low heat. Add the ground pork to the pan, breaking it apart into small pieces, and sauté until fully cooked. Remove the pan from the heat and drain out any liquid. Stir in the green cabbage, green onions, carrots and hoisin sauce until thoroughly combined. Transfer the mixture to a large bowl and let it cool for 10 minutes. 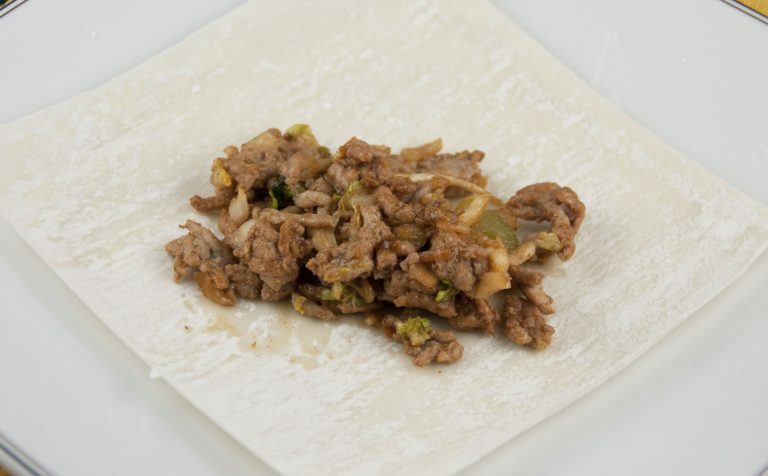 Arrange the spring roll wrappers on a dry work surface then place 3 to 4 tablespoons of the pork mixture in the center of each of the spring roll wrappers. Roll the wrappers around the mixture, folding the edges inward. Before your final fold, dip your fingers in water and then moisten the outer edge of the wrapper to seal the spring roll shut. Roll them tightly to prevent bursting in the oven. 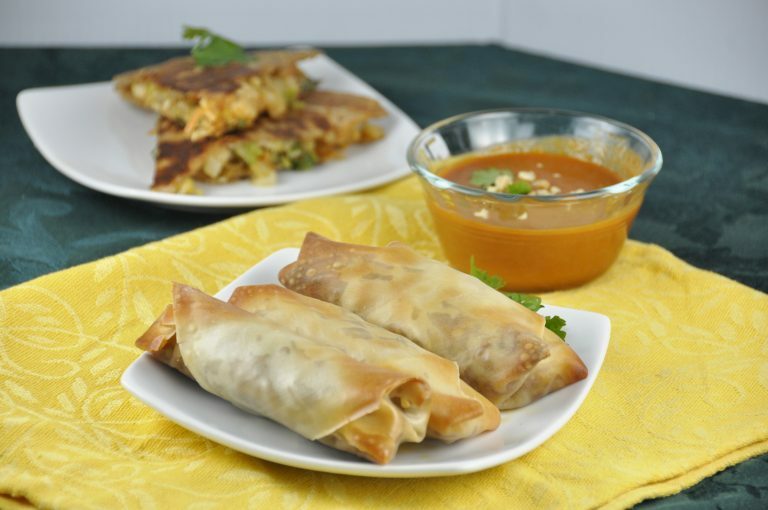 Arrange the spring rolls in a single layer on a baking sheet lined with parchment paper or a Silpat nonstick baking mat. Brush the tops of the rolls with olive oil then bake in the preheated oven 20 minutes, until golden brown and crispy. For crispier spring rolls, turn after 10 minutes (keep an eye on them as different ovens tend to cook things faster/slower). If they aren't crispy enough, leave them in a little longer. Remove the spring rolls from the oven and serve them immediately with your dipping sauce of choice (sweet and sour sauce, soy sauce, or dipping sauce I mentioned above). Combine chili sauce, vinegar, coconut milk, sugar, garlic, ginger, peanut butter, soy sauce and lime juice in a saucepan, whisking with a fork until combined. Heat over medium heat until mixture comes to a bubble, let boil for 1 minute then reduce to low and let simmer for another 2-3 minutes. Set aside and let cool. I want to make these immediately! Seriously, I’m planning on stopping by the grocery store on the way home from work. YUM! Glad you had a wonderful birthday cruise! I’ve never been on one and never thought I wanted to, but I’ve heard so many people rave about them recently- I’m adding a cruise to my bucket list. Your spring rolls look amazing! My daughter especially would love them. Thank you, Christin! I highly recommend a cruise – they really are the best vacation ever! Happy Belated Birthday, Ashley!! OMG, a cruise sounds awesome right now! I’ve never been on one but I’m dying to go–mostly because of the food and drink passes 🙂 and okay, the view and destinations are cool, too haha. These spring rolls rock! My sister and I have an affinity for spring rolls/egg rolls and sadly, there’s never enough to squelch our rolly appetite. Must double this batch for us during the Super Bowl! Thanks, Hayley!! Somehow your comment went into my spam so I am just seeing this now! These sound really good, I love spring rolls anyway so this is right up my alley 🙂 Thanks for posting. I am making these on Sunday! They look really good. Only change I will make is to do ground turkey in them so it is a bit leaner. Thanks for posting this! Your homemade spring rolls look really delicious! I can’t handle this – I’ve had such a craving for spring rolls lately and this is pure torture. What a lovely job you’ve done. Thanks for sharing! I highly recommend a cruise – best vacation ever! Welcome back with this gorgeous crunchy recipe! These spring rolls look absolutely delightful. This would rock at my house. Happy Birthday wishes to you and cheers to a fabulous cruise. I can see these being VERY addicting! Happy birthday! These spring rolls look and sounds pretty fantastic! Love the dipping sauce! Can’t wait to try these! I own a travel agency so if i can help anyone with a cruise just look me up! Definitely, Jamie! Just remember to really wrap the rolls tightly when assembling them, and also make sure they’re wrapped very securely in plastic wrap in the freezer. I would freeze them before they are baked! Just made these tonight with my friend who found this on Facebook. They are delicious! I did brown the pork first then drain and rinse it to decrease the fat. Also added 1 more tablespoon of peanut butter. Great recipe thanks for sharing and will definitely make again….maybe with grilled chicken chopped up. I love spring rolls and yours looks delish. So is the chilli dip. Yuuuummmm! My mom just made something very similar to this last night! She pan-fried them, but baking looks like such a good idea… so crispy you had me thinking deep-fried! this made me not filling guilty while enjoying the spring roll…. I make a version of these every year for a party. I am the same way with frying so baking spring rolls has always been my preference. Love these! These sound amazing! I love that they are baked. Great post! Thank you for this! My son is crazy for Vietnamese spring rolls and well, any kind of crunchy roll with meat will go over well. He’d plow through these. Love it! Do i use the egg roll wrappers found in the dairy section at Krogers? Yes they are the refrigerated wrappers.